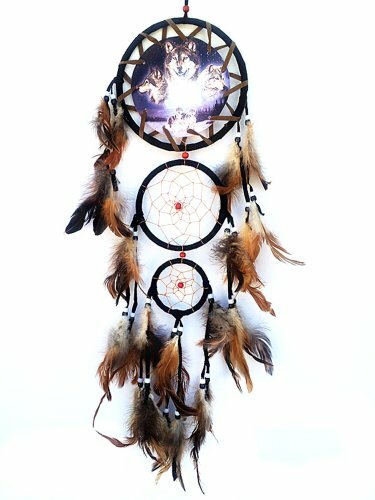 Dream Catcher is a traditional culture of Native Americans. They believe that a dreamcatcher changes a person's dreams.Nightmares pass through the holes and out of the window. The good dreams are trapped in the web, and then slide down the feathers to the sleeping person. Rings Diameters: top - 6.25" ; middle-4.5"; small-2.5" . Size (Please see additional picture): about 22" from the top ring to the bottom feathers; the hanging string is about 3-4" ; Total about 26" in length. Traditional room or car art craft !perfect gift ideas!